Gosh, has it really already been two weeks since the release of patch 5.5? I've been meaning to write about it but have kept putting it off in order to first be able to gather some more first-hand experience with the changes it introduced. 5.5 has been one of those updates that aren't very glamorous, with no new content on offer and a lot of work being done in the background to prepare for the upcoming server merges, but for long-time players there was still some good stuff in there, as Bioware continues to work on all kinds of quality of life improvements. 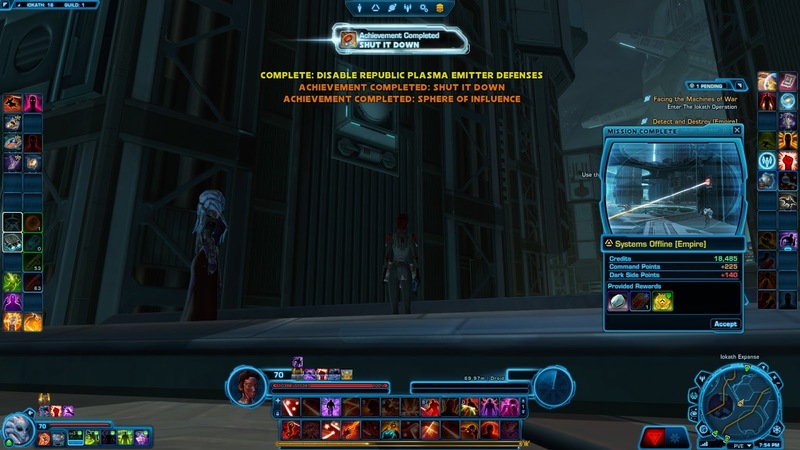 One thing that wasn't even in the patch notes is that all the daily missions on Iokath are finally available. 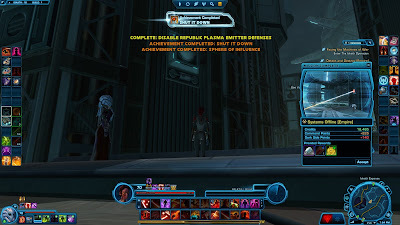 In my Iokath Daily Tips post back in May I noted that several quests that were listed in the achievement panel had yet to appear in the rotation, and they actually continued to be no-shows for another five months. Something clearly didn't quite go as planned there. However, after this patch the list of missions that are available each day suddenly grew quite a bit longer, and all the ones that had been missing so far were finally in there as well. I was quite pleased to finally be able to complete the achievement for having done them all. Something that's neither here nor there but which amused me was the update to the conquest board. Even though conquests were introduced in late summer 2014, long after the last round of server merges, the way guilds displayed on the conquest board still made reference to servers that no longer existed for some reason. So on Red Eclipse for example it would list guilds "@ Jolee's Hut" as competing with others "@ Nightmare Lands", presumably some leftover from the way the servers were originally folded together. Nobody really minded, but I guess it could potentially be confusing to newbies. Well, what do you know: Three years later and mere weeks before all the current servers will cease to exist, they finally updated the information on the conquest board so that all guilds on my server were correctly tagged as "@ The Red Eclipse". Now the big question is: When the server merges actually happen, will it show guilds "@ The Progenitor" etc. with the old server names, or will it be updated yet again to actually show the new and correct server names for everyone? You may not be dying to know, but I sure am. The Cartel Market also received its first real interface update since its introduction. I don't even use it much, but I still found the change to be a pleasant surprise because every now and then I would see someone with a store item and go "hey, that's nice, I would like to buy that too", but the old UI was not very conducive to friendly browsing. Now it finally has an actual search box (imagine any online store trying to sell you things without a search box these days) and everything is much better categorised. When I opened the right category for it, I was surprised to find that there was actually a hairstyle that I didn't own yet. Guess I simply hadn't been able to find it before! Strongholds have received some nice tweaks as well. First off, the cap was raised to ten, which meant that I finally had reason to go out and buy the Umbara train. I was honestly a bit disappointed when I first found out that I wouldn't be able to buy it without disabling one of my existing strongholds, so I decided to hold off on farming the currency for it originally. It's kind of funny because I don't even use my strongholds very much, other than my Coruscant home's first room, which is where I tend to load in and log out on most of my characters. However, I still like owning them all. More importantly, they finally fixed the issue with the intro cinematics! It used to be that you could only see the intro cinematic for each stronghold when you first entered it on any given character. This worked okay for that "inspecting the new place you just bought and which is totally empty right now" feel of your first purchase, but once you started decorating you soon realised that on any alts, the cut scene would look so much cooler because you could actually see all the decorations you had placed in the meantime. Yet the only way to see this cut scene again was to roll another alt. 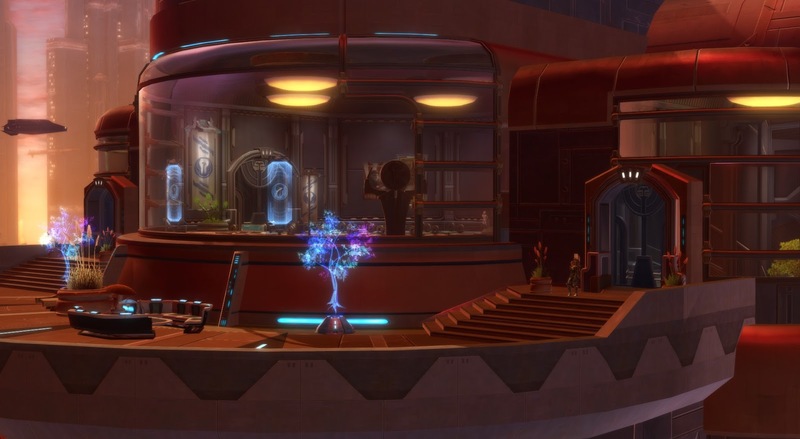 (Manaan then turned this on its head by instead playing the full cut scene every time you entered the stronghold on any character. That was annoying too.) Now it's been fixed so that after the initial visit on a new character, you can replay the little cinematic at any time by clicking a new terminal by the door. This was honestly one of those things I figured they were never going to implement because while it probably wasn't hard to do, not enough people would care. Thanks for caring, Keith! Nice outside view of the one stronghold I've actually bothered to decorate, courtesy of the new terminal that lets you re-watch the intro cut scene. I still haven't managed to convince my guildies to go hunting for Dark vs. Light bosses, but the new 18-hour-long victory states are definitely handy. Previously it could be quite challenging to catch that one hour when your alignment would line up with the correct victory state to get the most out of your accumulated CXP packs, but with a full 18 hours to go each time, it's become a lot easier. Have any of the recent small changes made your day? The biggest item has been that the mini-Reds can now access Rise of the Hutt Cartel and Shadows of Revan because of the available token for non-subs. Well, that wasn't part of the patch; that just came in with the KOTOR celebration two days ago. ^^ Also, I didn't know the mini-Reds were still fully F2P. Good for them then! I know it's never been fixed, but my biggest "minor" bug that I'd love to see fixed is the music issue on one of the heroics on Republic Tatooine. The one where you do the job that some mercs were hired to perform, and they try to kill you and steal the credit. Whenever I run into this heroic, the fight music at the end continues to play even after all the mercs are dead and I've left the phased area. Like I said, it's minor, but it is still annoying. Aww, I always liked that our guild on (the very rare occassions we make it to) the leaderboard showed its legacy of being formed on Frostclaw. Very few guilds go back that long to that particular server, since it's 2 (!) server merges back in time. I'm just nitpicking, though, it's really not something I care about a lot. Are you sure it used to show Frostclaw on the board? I don't think I've ever seen anything other than the ones mentioned in the post. And my own guild, which was originally on Luka Sene, was always tagged as TRE. If yours managed to retain its original server name, that was certainly strange.